I recently started using my Windows 7 Ultimate upgrade to Windows 10 and noticed among other frustrating issues an inability to connect to another computer’s administrative (the $ shares) share. As you can imaging there are time befitting the king of the networks’s need to connect directly to a drive on another computer and have total access to the entire drive rather than connect to individual shared folders. In this case, I was trying to connect to the D$ drive on a Windows 10 computer from another Windows 10 computer. I kept getting different error messages: “Access denied”, Network path not found”, “An error occurred accessing a device or resource”. You can connect to a Windows 7 computer from a Windows 10 computer or vice-versa and the functionality works. Trying to connect to a Windows 10 computer from a Windows 10 computer is a problem. You can connect to shares but not to administrative shares. I turned to my friend MR Googled and found that there is some added security in Windows 10 that prevents this type of connection by default. To eliminate the restriction, create the following Registry value, LocalAccountTokenFilterPolicy in HKEY_LOCAL_MACHINE\Software\Microsoft\Windows\CurrentVersion\Policies\System. The value is a DWORD and should be set to 1 in order to allow the connection to an administrative share. You need to reboot the computer for this setting to take effect. Outlook 2010 and other editions as well support multiple eMail profiles. 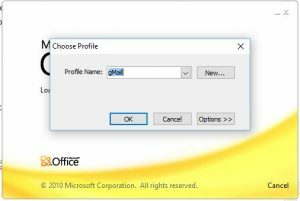 An Outlook profile can include a single mail account (POP, IMAP, MAPI, or what have you) or it can include multiple ones. An example of this would be to add all of your Gmail IMAP accounts into a single profile; your Microsoft accounts (Outlook, Hotmail, Live) into another profile. You get the picture. When you have multiple profiles setup and you launch Outlook, you get a window that allows you to choose which profile to load. You can see this below. You can use the Control Panel – Mail applet to create the profiles as well as select a default one to use. If you select the default, it will always launch that profile and you will not be able to make any choices. You can change this by running the Mail Control Panel app and unselecting a default profile. The Outlook selector shows the profiles in the order that they were created. If the third profile you created is the one you want to use 80% of the time, then you need to use the dropdown and find it. If the profile is the first one in the list, you just need to press the OK button. Just edit the value in Default Profile to match the profile names shown. When you Launch Outlook, that value will be presented instead of the profile listed in order created. Also note that Registry Editor in Windows 10, Find behaves a bit differently than Windows 7. CTL-F brings up the entry window and then it disappears; however, the value is cached so when you press F3, it reappears and continues the search. Generally speaking, I don’t write about problems I encounter in purchasing goods or services whether on-line or in a retail store. Stories are just not that interesting as they usually involve a little inconvenience in the time and effort it takes to return the item and get reimbursed. You ask yourself, “Why do I care?” The answer is that you probably don’t care but this particular transaction merits attention from an application systems perspective. My experience has been in design, building and implementing business solutions. In an Internet-connected world with the demand for instantaneous, accurate, results, it is imperative to get it right and get it right the first time. Here’s my story. I shop at Staples because they are in close proximity to the Level 7 Tech Group office, have a good selection of things technical like cable modems, routers, USB flash drives, printers, ink, paper, pens and other office supplies. Also, that $5.00 reward for recycling all of those ink cartridges, believe it or not, does tend to entice me into the store. I’m even enrolled in the Staples Reward Program. How’s that for customer loyalty? I needed a replacement Ethernet over Powerline adapter as my Cisco adapter decided it was going to be flaky and drop the network connection to my router. It took a while to isolate this because who would think a piece of hardware would go bad. It’s almost never the case. I went to the Staples store and found they didn’t have single adapters only WiFi extenders and they were sold in pairs. One of the associates in the store offered to help me and we went on-line to the website. We found a low-cost device made by TP-Link, a AV500 Nano Powerline Adapter (TL-PA-4010). She ordered it for me and I paid for it with a credit card. It was scheduled to be delivered to the store on Monday. I had some business later in the day in Palo Alto, so I decided to stop at the Fry’s Electronics store there and see if they had something in stock. Remember the saying about the bird in the hand. It was too good to be true. There on the shelf was the exact item I was looking for, the AV500 Nano. It was the last one. I purchased it and installed it when I returned to Level 7 HQ. It worked fine. It’s still working fine. I decided to call Staples to cancel the order. I dialed their 800 number on my receipt. Ever get on one of those calls where the call volume is set so high that people in the next county can hear the conversation through your earpiece? OK, lets dial down the volume and proceed. The phone system understood I wanted to speak in English and I wanted to return an item. It didn’t recognize the order number that I said and then keyed in using the touch pad on my phone. Let’s try something else, enter your phone number. Same results. Would you like to speak with an agent? Sure. Ringing… Hello, can I have your order number? I don’t recognize this number did you purchase the item in a store? I’ll have to transfer you. Question #1. Why did I get a number to call if I had problems that didn’t handle items ordered in the store? I was transferred to another group that did, indeed handle orders placed in stores. Unfortunately, they couldn’t cancel the order because it wasn’t completed. Apparently, this becomes a drop-ship order where the manufacturer fulfills the order and nothing can be done until the order is accepted by the store. I had to wait until Monday when the item would appear in the store. The promised delivery date arrives. I was going to call the original 800 number but then I thought, why don’t I call the store directly. After all, it is a store order. Ring, ring. I explain the reason for my call. The person, says to call an 800 number and guess what, it’s the same 800 number that I was calling. I explain this to the person but it goes no where. I call the 800 number and punch in the code to get me to returns. The phone system doesn’t recognize the order number or the phone number so I have to speak to an agent. Before calling, I logged to the Staples web site and went to my orders and there wasn’t an order listed there. Why? Because I didn’t place the order through the web site. The store placed the order and the store owns it. Unfortunately, the employee at the store couldn’t “grok” this. I’m connected to an agent who can’t find my order. This is “Ground Hog Day” – the movie. I get transferred to an agent who can handle store orders. She finds the order. I reply that I was hoping to avoid a trip since the item was not delivered to me. “Let me call my Help Desk”, comes the reply. I’m on hold. “It’s your order number.” The dreaded order number that only a select few know about and is only actionable on by the Help Desk. I thank her. Sensing my good nature, she asks me if I would like to participate in a survey after the call. I say, I would have nice things to say about the interaction but not about the Staples “return” process. She presses the transfer button. “Please enter your employee number in order to transfer this call to the survey line.” Well, so much for trying to be a nice guy. It’s 7:30AM and I get a call from the Staples store by a real person informing me that my item has arrived in the store and I can pick it up any time that is convenient. I reply that I cancelled or “returned” the order yesterday. Checking my credit card on-line – there is no return pending. I decide to call the store. The phone tree has difficulty routing me but eventually I’m speaking with a person. I say that I’m calling about an order that was placed in the store. He asks for my name, and the name of the item that I ordered and puts me on hold while he has an associate find my order. The associate tells me that he has located my item. I tell him that I want to return the item and get a refund. I also mention that I have been trying to return the item since Monday. He says to come into the store. I ask him why I need to come in to the store to return an item that the store has in it’s possession. It’s so that they can put the amount on my debit card. I mention that I paid with a credit card. This conversation is going nowhere, so he asks if I want to speak to his supervisor. Great initiative! I take him up on his offer and speak to Mohammed. I explain the situation. Mohammed takes the initiative and calls the appropriate Staples department to find out how to process a return and says he’ll call me back. Less than an hour passes and Mohammed is on the line. He asks for my address because they need to cut me a check. Apparently, the department that processes the returns is not able to post a credit to my charge card and was preparing a refund check. The only address that they had on file was the store’s address. That stopped them cold and the effort would have ended there. So Mohammed gave them the Level 7 Tech Group address and a refund check is supposedly on its way. In this case the delivery was to the store. The store had the item. They know the credit card that was used to pay for the item. Still I can’t get a return without apparently having to go into the store to present my credit card. I admit, that I’m still trying to wrap my head around this. order it using your Staples account online. If you choose the last one then you have to weigh the implications of where to take delivery. Suddenly, when needed the most, you find that your HP printer misbehaves. No, I don’t mean the error that you have not installed a “genuine HP cartridge.” That’s really irritating and may force you to purchase an additional cartridge or two to appease the beast or if the cost of the replacement cartridges equals or exceeds the cost of a replacement printer, then it’s time to take a hammer to the plastic and shop for something new. Hopefully one that still uses the print cartridges you still have in your possession. Ok, My printer stopped printing in black ink. It actually printed in oh, so very light gray. No matter what I tried, nothing worked. Align Print Heads – nope. Clean Print Heads – a great way to empty your print cartridges, so you will buy new ones! Try printing a diagnostic page. Nice if it weren’t for the fact that black doesn’t show. I tried printing a test page from the Printer Properties and it confirmed my suspicion that it wasn’t a software problem. But why black? The HP Forums, like all other “free advice” are worthless. Until you find the right one! Let’s give credit where it is due. Check this solution from Jack Kennedy on YouTube. The video shows you how to remove the print heads, give them a shower and reinsert them back into the printer. The only thing I can add is be careful when you take it out because it is really gunked up and you’ll get dirty fingers if you aren’t careful. Why black? Well, its the most popular color we use isn’t it? Stands to reason. One last thing. When you re-assemble the components and power on the printer, be prepared to go through a series of tasks while the printer fills up the ink reserves in the print head. It will go through a number of requests to clean the print head so that ink flows evenly and then a series of alignment tests. If you don’t follow along with the requests you will be interrupted and asked to perform the test every time you print a document. Best to comply. One last thing, these tests as we know tend to drain the ink supply, so be prepared. This posting is provided “as is” with no warranties, guarantees or rights whatsoever. The late Steve Jobs had a reputation for telling people exactly what was on his mind when working with an Apple product in development. I think the phrase was “This is crap!” or words to that effect. I just went through the upgrade process on my Windows 7 installation to Windows 10. I’ll agree with Steve on this one. I found the secret to removing the Windows 10 icon. I really didn’t discover this from painstaking personal research. No, I asked Mr. Google and he pointed me to several web sites, so I thought I would pass the secret on. That is it lies hidden in a Windows Update, “KB3035583”. It is marked important, so you probably installed it without paying attention to what those “important” updates were. You always apply the “critical” ones. Don’t you? I did back in July. To get rid of it, go to Programs and Features, click Windows Updates and search for it. When you find it, uninstall it. You will need to reboot. When your computer comes back, immediately go to Windows Updates. Like Dracula, it comes back or was that Glen Close in “Fatal Attraction?” Right-click and Hide Update. If you don’t it will come back…to your utter astonishment. Veeam recently published the Veeam Endpoint Backup Release Candidate (RC). I found out about it while browsing through the Forums. Here’s the link to the post: http://forums.veeam.com/veeam-endpoint-backup-f33/veeam-endpoint-backup-free-rc-t26694.html. It contains a list of new features and fixes. The bits are located here: http://www.veeam.com/download_add_packs/vmware-esx-backup/ep1_rc/. You will be asked to login to complete the download. If you don’t have an account you can create one. I went back to a previous installation on my old Dell Inspiron 8600 laptop. Details of my first go round with VEB are documented in this post: http://level7techgroup.com/blog/?p=1388. First thing to note is that you can’t install over an existing implementation. Use the Add Programs and Features wizard to uninstall the previous version. Run the setup program as an Administrator. A window comes up if you have Avast anti-virus installed to either whitelist the Veeam setup program or turn off active screening. I chose to suspend screening until the next time the machine is rebooted. Nice touch, since this was a sticking point the first time around. Setup takes about the same time as the previous installation. You see progress bars but not a lot of chatter during the setup. When the service starts, setup asks if you want to create the Recovery disk. You can skip this part and create a Recovery media at the time of your choosing. You can use USB memory stick (32GB minimum), other attached storage, CD/DVD or an .iso Image. I didn’t have a USB of sufficient size but did have some blank CDs on hand. That process apparently writes an image and then transfers it to the CD. This takes a while to complete. The last thing setup offers is to create the backup job for you. You cans skip this to exit setup and then create the job from the VEB console. The link to it is off of the Start menu or it is visible from the task bar when the service is running. Backup times are comparable to the initial release. Use the Recovery media to boot up the computer. Your options include the Veeam recovery as well as the Windows Bare Metal Recovery. Also, you will find a Memory Diagnostic, Command Prompt and an option to load the Explorer to recover individual files. When you use the Veeam Recovery option, your options include a Full Image, Volume and File recovery options. I performed a Full Image recovery replacing the entire current drive with the backup image. If you have performed a number of backups, you can choose a rollback time period as well. I chose the current one. My 40GB notebook computer took 1 hour and 6 minutes to complete. It takes a while – enough time for a lunch break and/or a short nap. So that’s it. Stay tuned for an update on the VEB when the product availability is announced. It will be interesting to see how it’s positioned in the Veeam Infrastructure. Veeam Backup and Replication provides a PowerShell scripting environment to help administrators manage their Veeam installation. Veeam Backup Powershell SDK as it is known is a PowerShell snap-in. You’ve probably seen it as an option that is available but not automatically selected by the setup program; so if you miss it at installation time, just find the installer (.msi) in the product image .iso file and install it from there. Running commands in the PowerShell command window or the ISE is fairly straightforward but I was looking for a way that I could use the Windows Task Scheduler to fire off a PowerShell script. Here’s my story. Replication is the process of copying a VM from a source host to a target host which may be a redundant host in the same site or more often than not to a Disaster Recover (DR) site. Veeam creates an exact copy, called a replica, registers the VM on the target and the job keeps the two VMs in sync with each other. Veeam uses the same efficient technology creating local backups and applies it to replication. This includes using compression, change block tracking to eliminate duplicate and empty data blocks, network throttling, and WAN accelerators.